HIdden away on the north side of Arcadia is the Camp Arcadia Colony. A small but welcoming community. Nestled within the camp you will find Lake Michigan View, a family friendly cottage. Because we considers dogs part of the family, they are welcome too! Lake Michigan View sits directly on Lake Michigan, with breakwall access. Since Lake Michigan changes yearly, some summers you will find a small sand beach in front of the breakwall. Once the snow melts this spring, we will know for sure! While you are visiting you can enjoy an abundance of activities in the area if you choose to stay close to the cottage. Hiking, laying on the beach, and visiting local historic towns should keep you plenty busy. If you desire to venture out, make sure to head north on M22 and take in all the scenic drive has to offer. Don't forget to visit Sleeping Bear Dunes along the way! Feel like relaxing at the cottage? We have you covered! Lake Michigan View has an expansive deck overlooking Lake Michigan and just as the name suggest, a view that will make you want to stay there all day! Enjoy the breeze off the lake while reading that book you haven't had time to open. Make sure to stop and get some local wine, brew, or spirits to sip while you relax. When it's time to wind down at the end of the night, Lake Michigan View has something other cottages don't... your own personal sauna! You really can't go wrong with Lake Michgan View! 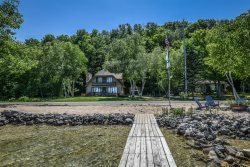 It checks many of the boxes for a wonderful vacation home on along the Lakeshore!